It seems that each January while teachers are on holidays there is some natural event that we can get our teeth into and 2011 was no exception. Are our students getting the most from the events in our absence? Are we teaching them the skills to learn when we are not around? This is perhaps one of the main reasons to show students how to use and understand social media in order that they actually learn how to use it in our absence. There are major national and state natural events which happen in our absence and are our students fully prepared to process the causes, effects and management of these events by themselves? Bushfires and cyclones have been common in January in Australia and the floods of 2011 have taken things to another dimension. Like many of my students I was on holidays and perhaps unlike many of my students I was getting all my information from Twitter. The Geographer in me was pretty aware of what was happening with the floods. I noticed the Bureau of Meteorology (BOM) spin in one of the early press conferences. Would the majority of students been astute enough to pick this up in our absence and if they did not have we failed them? The BOM spokesman was saying that their modelling was accurate for the forecasting but did not have the capabilities to factor in all the local variables. At the time I was wondering if this was to the disclaimer or spin. Then a couple of hours later the Prime Minister Julia Gillard was asked if the government would give BOM more money so they could improve their modelling. The Premier of QLD Anna Bligh stepped up and said that the BOM was fine and that technology had not caught up and could not do all that needed to be done. What was that the Premier said – technology had not caught up? From this point on I suspended my natural interest in the geography and started to look at the whole experience from the point of view of technology and social media. Those involved with the Geographical Society of NSW and academic geography are aware of some of the work carried out by hydrogologists, marine scientists, geomorphologists and the technology they use for their local predictive capabilities. Teachers too can have experience with technology and social media which can be used for investigating the floods. I took time in January to take a closer and more analytical look at how it was used in Brisbane for the floods. Soon I realised that many students would be missing out on this avenue of learning because perhaps they had not been exposed to the educational value of social media despite their active use of social media in other avenues of their life. The difference is in who they follow and increasingly I am of the opinion that students need to separate their personal and learning use of social media tools. We as teachers should accept the responsibility to guide them in this process. This may mean teachers using Twitter for their learning and Facebook for their social life. Or perhaps using Facebook socially and the judicious use of “Groups” and the “Like” function of the more learned aspects of Facebook. 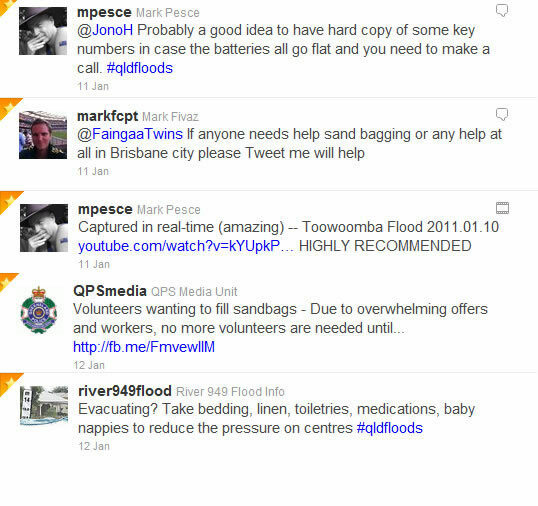 I just want to share with you my experience of the floods using social media, mainly Twitter, for professional learning in relation to the QLD Floods. I was only using my phone (Nokia E71) because I was not in WiFi range. 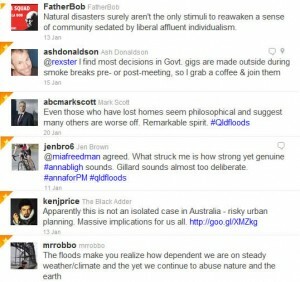 I collected all the Tweets I found useful to understand the lead up to and the peaking of the QLD floods. After the peaking of the floods I stopped collecting the Tweets. Hence the information I am commenting about is limited to a certain time frame, to those people and organizations I follow and to following the key hash tags for the floods such as #qldfloods. A few years ago I wrote about the use of Twitter as a tool of social media for viral professional development and to get information out about an event before mainstream media. In fact Twitter often alerted the world to an event that was happening. This proved to be the case again in February 2011 with the developments in Egypt and later in different countries of Africa and the Middle East. This time in Australia with the floods it became clear that mainstream media had bridged this gap and actually used social media to feed information to themselves. The Channel 7 Sunrise program used their Twitter accounts to gather and process information in the field. I was noticing the use of Twitter has changed. It was more formal and informative rather than random and generalist. 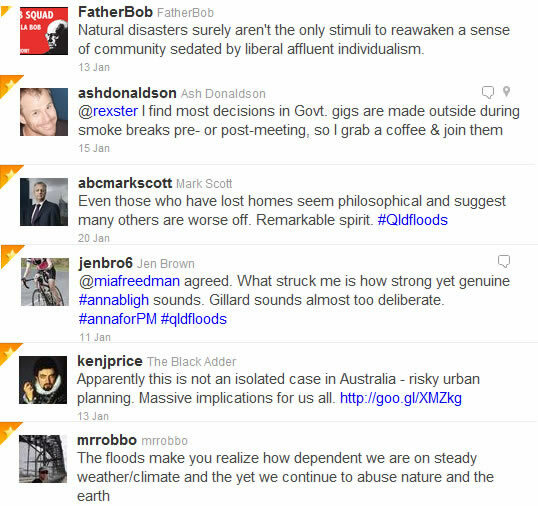 With the Victorian bushfires in February 2009 many of the tweets were providing information about things that we could not get from other sources. Twitter users were starting to process and analyse these results. Twitter, as if it was an organism itself, adapted and started to take on a different role. Tweets were used to show the evolution of the event. 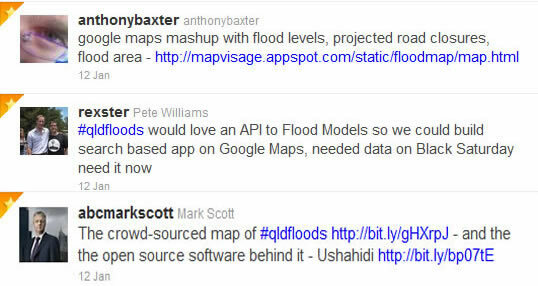 There were many good photos, videos and map mashups on Twitter showing rising water levels. All this information was interesting and gave real time examples of what was happening but no real geographical fix was being made. People were giving suggestions of what to take and leave behind in the case of evacuations. See Figure 1 tips and help tweets for some examples. Tweets from organisations started to add value to our understanding of the event. Snippets from press conferences for those not near the television outlined where the road closures were happening. It became clear that organizations were seeing the benefits of getting information to people. Some individual Tweeters were data mining information from key organisations. These people were also viral in spreading information during the bushfires in Western Australia and floods in Victoria. There were also organisations that were putting together emergency information specifically about the floods such as the QPS Media Unit. Soon other organisations were spreading their word through other social media sources such as the QLD Police Facebook page. 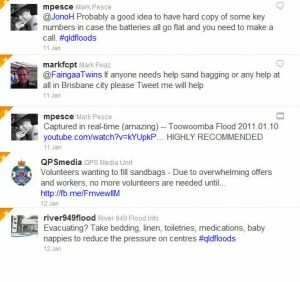 Tweets were used for the crowd sourcing of information and the “mash up” of resources about the floods. Crowd sourcing is where groups of people share their collective knowledge to put together some sort of useful information or product. Crowd sourcing is not new but the speed at which it was developing during the floods was quite distinctive. This was a new development with the use of Twitter and natural events. Experts from Google were collecting data and embedding data with Google Maps creating a series of overlapping maps of the floods showing their spread, and some cases projections. Many other individuals were creating mashups of data mined from twitter and other sources. See Figure 2 on crowd sourcing tweets for examples. It also appears that Google has a formalised a Crisis Response Team where experts went to Christchurch and in Japan to help out with earthquake mapping. The pitching in and helping tweets. 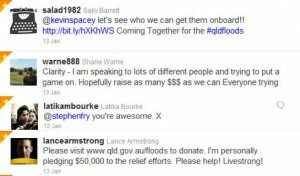 Tweets about raising money and charity events started to appear even before the flood levels had risen in Brisbane. This is where everybody including high profile celebrities were pitching in to help. This was really interesting with leading sports people making all sorts of suggestions for special events such as celebrity cricket matches legends of origin league games, there were fundraising events at the Magic Millions at the Gold Coast and specific donations by high profile sports people such as Lance Armstrong. 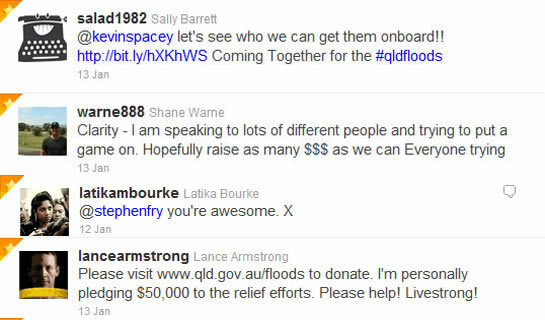 The word about the floods really spread when international Tweeters such and Lance Armstrong, Stephen Fry started to contribute by donations and spreading the word for people to donate. See Figure 3 for pitching in tweets. Reflection and evaluation tweets – I have only really discussed the tweets during the height of the floods. Over time tweets started to look more carefully into broader issue. Father Bob, in Victoria, questioned why it takes a major event to trigger the charity instinct in people rather than doing something all the time or at least on a regular basis. Some were asking why was so much water released for the dams at once which involved reflection on government policy. Soon after this the tweets started to talk about the need for volunteers and help with the cleanup. See Figure 4 for examples of evaluation and reflection tweets. How can these examples of the use of social media, specifically Twitter, be harnessed for education and specifically geographical education? Firstly, students need to collect information about events. The use of information gleaned from Twitter adds value to the traditional modes of information collection for researching contemporary issues. Major media outlets such as Sunrise, SkyNews and the like were using Twitter to get out information rather than waiting for the next edition of the news or print run of the paper. This also allowed for more considered and analytical commentary in the printed media when it was released often making use of the crowd sourced mashups of pre and post mapping with aerial images. Secondly, the information gleaned from Twitter varies in its accuracy and authenticity. It is a perfect medium to teach students the value of cross checking the reliability of information. For example, at one stage during the floods an Ipswich Council Member tweeted that some bodies were found in a certain location. Watching the process of the police and emergency services checking the validity of this tweet not only proved it to be false and resulted in the Premier Anna Bligh actually commenting during a media conference asking people to be careful what they tweet. Thirdly, there were interesting examples of moral and ethical dilemmas evolving from the tweets. For example Father Bob questioning why it takes a major event to get people to make donations and help. Peoples’ reaction to comments in the formal media about looters was interesting and thought provoking. The Mayor of Ipswich suggesting they should be used as flood markers the Premier succinctly suggesting there is not a word in the English language that is strong enough to express her opinion on looters. Fourthly, more so than in past events Twitter and Social media helped galvanise the populace into civic action to support and volunteer to help those in the floods. Social media helped make it happen. The record numbers of volunteers come from all over Australia to help and third party volunteers organisations had to assist to organise the volunteers. In fact I read on Twitter a few weeks later that they had done such a food job that they had saved the insurance industry millions of dollars in their clean up costs. I wonder if that will be recognised by the insurance companies. Almost all mainstream organizations and businesses see the value of social media and use it or have plans to use it for their endeavours. Some educational organizations do so as well. However, many teachers are not embracing the social media and accordingly do not have sufficient understanding of its value and use. Are we failing our students? On two levels I think we are: firstly because we are failing to adapt, see the value of social media tools and secondly because of this we don’t have the skills to help our students use the tools they are already using to enhance their learning in our absence. Personally I believe a critical mass of student use of social media has developed. They are ready to be lead to the next stage of their learning of geography with technology. I pondered whether I was capable of doing this and whether they were ready to take the leap. The answer to my question came to me through some student initiatives. On a recent fieldwork trip my students got out their phones and recorded what I was saying at a location in Pyrmont while other students were taking photos and videoing of what I was talking about. Other students used their phone to find key information about sites such as the price of a terraces and units that they noticed for sale and the type of business they read on a building plaque. The students were using their phones to collect information in the field. I did not ask them to do this and I was impressed at their initiative. In fact the students took it to another level. I was walking through the library later that evening and a group were sorting out their photos and videos, putting the audio into Audacity and the clips into Moviemaker and were making a presentation linking up my audio with the relevant pictures. I now want to take my students to the next stage and teach them how of using social media for their January Geography (or holiday/weekend geography) when I am not around. I am still working out how best to do this and from what I have learnt from the floods and my recent fieldwork experience suggests they are ready. This entry was posted in Geography, Zen. Bookmark the permalink. 2) Oldies treat ICT in education as something to make a song and dance about. My students frequently make use of technology in ways that I (aged 34) find mildly innovative but which they find obvious. Why structure an entire industry of academia and bureaucracy about this? How would you have felt as a teen if your teachers and education departments had been spending countless hours and millions harping on about the educational benefits of the mechanical pencil? I(C — 50% grant bonus for the extraneous initial? )T is just another tool. It might amaze the old fuddy duddies but for today’s students it’s just part of the furniture. Get over it! Sorry for the focus on oldies but it’s currently a convenient cutoff between those who grew up with computers and those who did not. We must get over treating IT as a novelty. However this will take time as the (manufactured) perception of novelty attracts funding. I can see it now… @Shazza “Dazza reckons if you douse your house in petrol it will ward off the fireballs by feng shui” +1, 12874 Likes.